Silk, dried or fake rose petals don’t compare to the real Rose Petals. Our Fresh Rose Petals are Soft & Beautiful with a velvet feel to the touch. 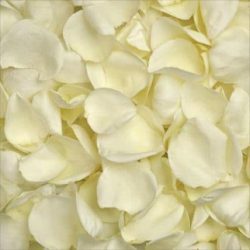 Our Fresh Rose Petals have a natural romantic aroma, soft scent. Unlike other rose petal vendors, only Premium Fresh Rose Petals go into our petal bags. No ugly or bruise rose petals. 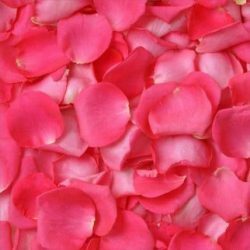 Fresh Rose Petals are a beautiful touch for weddings or any romantic occasion. Remember to order extra Fresh Rose Petals for your honeymoon or for a romantic weekend getaway. Here are some romantic ideas for your Rose Petals. Make a romantic trail of fresh rose petals leading to the bedroom. Scatter the rose petals on a candle lit table for two. Scatter rose petals on bed and pillows. Add fresh rose petals to a romantic bubble bath. Rose Petals will stay fresh for 7 days, when kept in sealed bags and kept in a refrigerator. 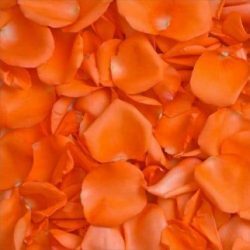 Unlike cheaper petals available online, our petals are NOT swept off the floor, or discolored guard petals. 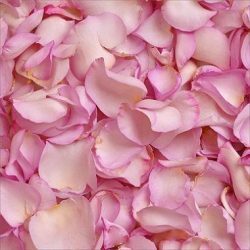 Our fresh rose petals are beautiful premium petals that have never touched the floor or discarded petals from a florist. Only the best petals go into our fresh rose petal bags. 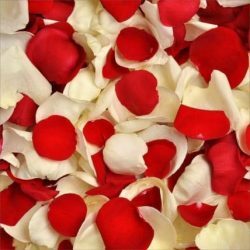 When quality matters for your wedding, event or special occasion, our fresh rose petals are the best! 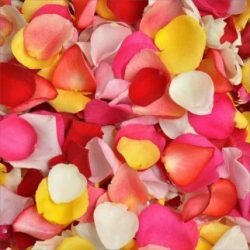 We offer a 3,000 rose petals bag and our most popular seller is the 6,000 rose petal bag. How to keep rose petals fresh looking.Eliminate moisture from external surfaces of rose petals. Spread the petals out on a paper towel or cloth and lightly pat them with a paper towel or cloth to remove any excess moisture. While the freshest rose petals are full of moisture on the inside, too much moisture on their outsides can compromise their freshness, causing them to become soggy, moldy and discolored. Line the inside of the petal bag with paper towels to absorb excess moisture from the petals. Store rose petals in sealed bags. · Keep rose petals in a cool place when not in use. A refrigerator is an ideal location to store rose petals. Make sure the refrigerator is not too cold, which may cause the rose petals to freeze; once they thaw, they will be soggy and discolored, so avoid storing under 35F.Buy Wholesale Bulk Fresh Rose Petals Online.